Putting you first. And the accident behind you. St Kilda Village Accident Repair Centre delivers a professional, honest panel beating service at a highly competitive price. All of our work is fully guaranteed. Anyone using our panel beating service here at St Kilda Village can be confident of prompt and professional repairs, using genuine manufacturer approved parts, the highest quality paints and consumables. Our dexterous panel beaters have many years of panel beating experience in small and large panel repairs. The people of Prahran, South Yarra, St Kilda and from all over Melbourne know they can trust the panel repairs done at St Kilda Village Accident Repair Centre. We are located in inner South Eastern Melbourne, servicing Prahran, South Yarra, Windsor, St Kilda, South Melbourne and all surrounding suburbs. We are proud sponsors of local football clubs and support our neighbouring businesses in the Prahran, Windsor and South Yarra surrounds. We specialise in panel repairs on prestige vehicles (including Volvo, Mercedes Benz, BMW, Audi and Land Rover). Our workshop is equipped with the latest equipment to provide the highest possible accident repair standard. 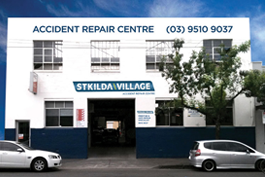 St Kilda Village specialises in car accident repairs and panel beating servicing St Kilda, Prahran, South Yarra, Malvern, South Melbourne and greater Melbourne suburbs.